Everyone is Irish when there’s an Irish Coffee to be had. Photo courtesy Sobieski Cinnamon Vodka. This is Page 1 of a two-page article on Irish Coffee. Click on the black links below to visit Page 2. You might think that Irish Coffee is a centuries-old drink, enjoyed by many generations of Irish folk around a hot fire at home or at the pub. But truth be told, it originated in the era around World War II during the dawn of transatlantic plane travel, from 1939 to 1945, when air travelers from America took an 18-hour seaplane (known as a “flying boat”) to Port of Foynes in County Limerick, Ireland. Passengers took a boat from the seaplane to the terminal—the seaplane base preceded the construction of Shannon Airport. By 1942, a restaurant had been established to welcome the travelers, which by then included such luminaries as Humphrey Bogart, Douglas Fairbanks, Edward G. Robinson, Ernest Hemingway and Eleanor Roosevelt. Heat a stemmed whiskey goblet. Pour in one shot of Irish whiskey. Fill with strong black coffee to within one inch of top. Stir gently. Top off to the brim with heavy cream*, slightly aerated by pouring it over the back of a spoon. Important: Do not stir after adding cream, as the true flavor is obtained by drinking the coffee and whiskey through the cream. Pouring the cream over a spoon to make it float takes a bit of practice. Photo: For your Irish Coffee, try some Jameson Irish Whiskey or some Tullamore Dew, both favorites at THE NIBBLE. *Note: American supermarket whipping cream is ultrapasteurized to increase shelf life. This detracts from its ability to float on top of the mixture. 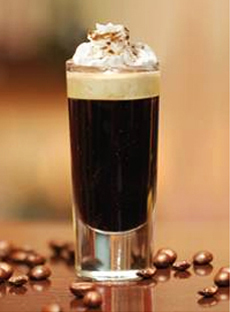 If you can obtain untreated cream from a farmer’s market, it will produce a better Irish Coffee.